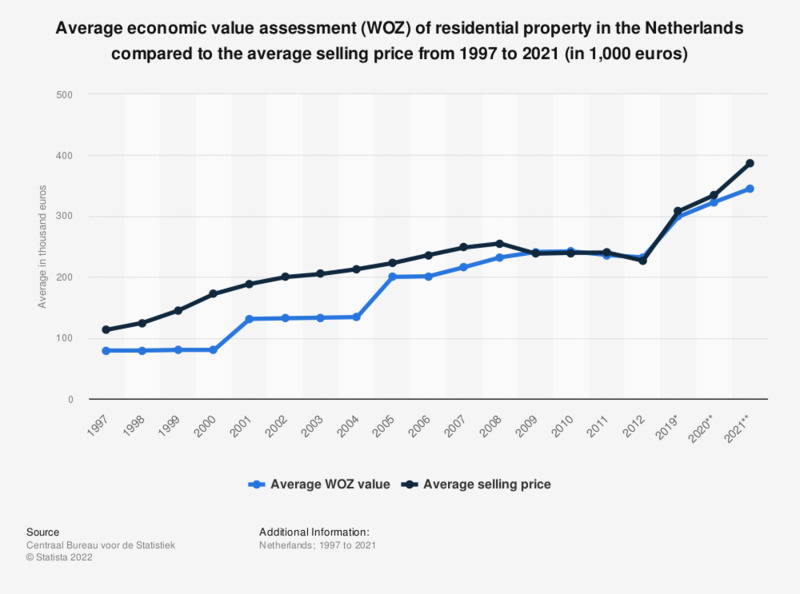 This statistic shows the average economic value assessment (WOZ-waarde) of residential property in the Netherlands compared to the average selling price from 1997 to 2018 (in thousand euros). Municipalities in the Netherlands are responsible for implementing the Valuation of Immovable Property Act (or WOZ). They assess the value of immovable property, such as houses, by carrying out a taxation. The calculation of this WOZ value is based on the amount the property would have sold for on the reference date (January 1st of the previous year). The value is passed on to the water authorities and the Tax and Customs Administration and is being used to calculate taxes. In 2018, the average selling price for residential property in the Netherlands was approximately 287,000 euros, which was higher than its average WOZ value of approximately 230,000 euros. * The number provided is provisional. Are you compliant with U.S. tax filing and financial account reporting requirements?